The proposed Manchester geothermal project involves the construction of an underground heat plant which is capable of providing heat to around 6,000 homes and businesses. GT Energy has started work on the next phase of its geothermal scheme, which will provide a secure supply of cheaper, renewable heat to homes and businesses in Manchester, UK. Ireland’s GT Energy and E.ON UK, one of the UK’s leading power and gas companies, have signed a Memorandum of Understanding to develop five new deep-geothermal heat and distribution systems. Planning permission for the first geothermal electicity plant in Ireland has been obtained by SLR Consulting. 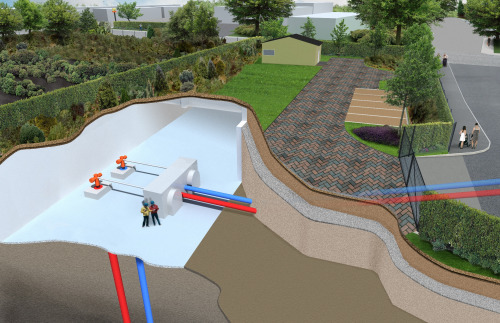 GT Energy taps SLR Consulting to submit a planning application for the next phase of its proposed deep geothermal heat plant and district heating network. The instruction follows SLR Consulting’s recent success in helping GT Energy to secure planning permission for the heat plant element of the scheme – a project which involves the drilling of two 3,200 metre deep boreholes and the construction of an underground heat plant which is capable of providing heat to around 6,000 homes and businesses. SLR’s brief includes the completion of a number of environmental studies and the submission of a planning application for a district heating network. This will connect the proposed heat plant site in the Ardwick area of Manchester to the Oxford Road corridor and the city centre.